Eagerly awaited by all Bourbon fans, the annual release of the Four Roses Small Batch Limited Edition is one of the highlights of the whisky calendar. Those who know a thing or two about Four Roses will know that they specify not only two different mashbills, but also five different propriety yeast strains, with the result being they use 10 different recipes at the distillery. Mash E is a lower rye mashbill of 75% corn, 20% rye and 5% malted barley. Mash B is made with 60% corn, 35% rye and 5% malted barley. The yeast strains range from delicate and creamy, to spicy and fruity. 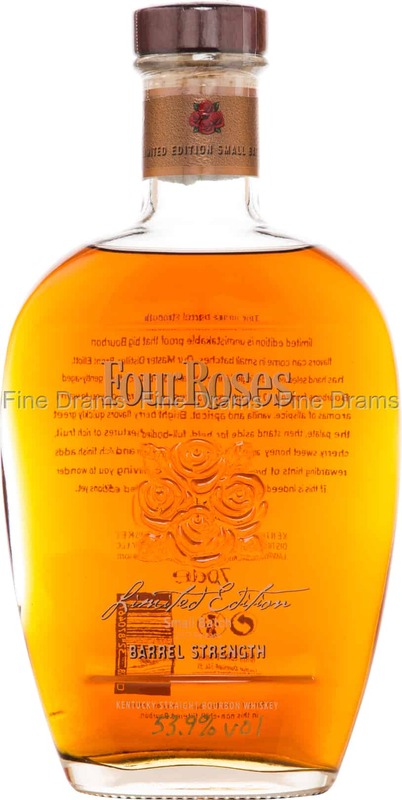 This bottling will excite long-term Four Roses fans, as it is the first Small Batch Limited Edition to blend together Bourbons all made with the E mashbill, producing a sweeter whiskey that is sure to be a crowd-pleaser. Indeed, this bottling marries together a 15 year OESK Bourbon, a 13 year OESK Bourbon and a 12 year OESV Bourbon. Yeast strains K and V are known to be amongst the most full-bodied in the distillery’s repertoire, meaning that this whiskey has plenty of depth and flavour. Master Distiller Brent Elliott stated that although this was only the third sample he tried, he knew this was the right whisky for the 2017 Limited Edition Small Batch. It is rare to see a Bourbon where the constituent parts are of such a great age. The result is a powerfully flavoured and complex whiskey. Drinkers should expect flavours of barrel char, toasted spice, powdered cinnamon and mild chilli, cloves, potpourri, tinned peaches, apricot, plums, raspberry, burnt brown sugar, vanilla, slight herbaceous rye and cornbread. Bottled at a generous 54% ABV, this is a whiskey that does not sacrifice anything in flavour or mouthfeel. Under 11,000 bottles were produced worldwide.